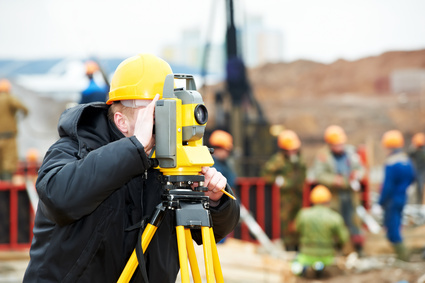 Surveying is the practice of making accurate measurements of the earth’s surface. It is a broad practice that includes multiple areas of specialization, and some of these specialized applications use equipment that is not commonly utilized elsewhere. The simplest type of surveying is known as plane surveying. It does not take into account the various elevations of the features being surveyed. This technique was used by the early Romans to create reasonably accurate maps of relatively small areas. It required only a plane table, a level, a known length of rope or measuring chain, and a straightedge along which lines could be drawn. A plane table was simply a flat tabletop with a large sheet of paper upon which to draw the map. The paper was usually placed on the leveled surface of the table so that the edges ran from north to south and from east to west. The table was positioned at some landmark to be mapped, and a pin was placed into the paper to represent the intended location of that spot on the map. This reference position was known as the first position. Next, the surveyor selected the second landmark to be mapped, sighted along the reference pin and placed a second pin at the edge of the paper, between the reference pin and the second landmark. A straightedge was then used to draw a line from the reference pin to the second pin. The surveyor then moved the plane table to the second landmark. The table was carefully aligned so that the line from the second position to the first position pointed directly back to the original placement. The surveyor then repeated the process of sighting the remaining features to be mapped and placing pins. When lines were drawn from the second position to the new positions of the features, the lines intersected with the lines from the first position to those same features. The point of each intersection was the position on the paper map where each feature was drawn. A known length of rope or measuring chain was used to accurately measure the distance from the first position to the second position, and this distance provided the scale for the map. As plane surveying became more common, the straightedge was replaced with a device known as an alidade. Alidades were straightedges with vertical sight vanes positioned at each end. One of the vanes featured a narrow slit, and the other was fitted with a vertical wire at the center. Surveyors used the alidade to precisely align the straightedge toward the landmark to be mapped. Plane surveying is reasonably accurate for small areas, but geodetic surveying requires the precise measurement of both horizontal and elevation angles. 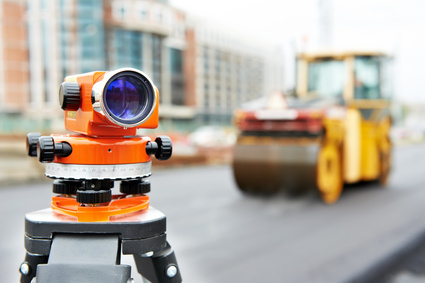 The areas surveyed are often extremely large, and tiny errors in angle measurement would result in large surveying discrepancies over any sizable distance. The surveying instruments used for precision measurements of vertical and horizontal angles are known as theodolites. Theodolites are usually placed on a tripod for support, and they feature adjustable graduated measuring circles that allow accurate horizontal and vertical measurements. Early theodolites featured an alidade for sighting horizontal objects and a second alidade for vertical angle measurements. This design was gradually replaced by a single vertical alidade that was mounted on a rotating graduated base, to measure horizontal angles directly. The vertical alidade of the early design was ultimately replaced with a sighting telescope. By the mid 1800s, the vertical and horizontal measuring circles were finely graduated, and the device had become known as the transit theodolite. Modern theodolites feature a movable telescope mounted within two rotating perpendicular axes. The horizontal axis is also called the trunnion axis. The measuring circle of each axis is typically graduated in seconds of arc. The horizontal and vertical circles are read electronically in modern equipment. A CCD image sensor is incorporated into the focal plane of the telescope to automate both the object targeting and the offset reading. While some theodolites still have optical-mechanical components, many surveying devices are now fully electronic. These devices, which are known as totaling stations, electronically measure not only angles but also slope distances from the station to the targeted point. Distances are measured by directing a laser from the totaling station to the target point. The laser bounces from a reflector back to the station, and the distance is determined by the time taken for the laser to travel to the target and back. Many totaling stations are controlled by a remote. A single surveyor positions the station and then travels to the target with the reflector. The totaling station is activated by a remote control device and automatically focuses on the reflector and makes the measurements. Totaling stations are usually linked to GPS systems and send data directly to the surveyor’s computer. In the mining industry and in the construction of underground tunnels, a special theodolite known as a gyrotheodolite is used. The gyrotheodolite contains a gyroscope that can sense the rotation of the Earth. This allows the meridian, which is the plane containing both the observation point and the axis of the Earth’s rotation, to be established underground. The intersection of the meridian plane with a horizontal plane allows the device to establish north-south geographic references. In this way, gyrotheodolites are able to determine true north even underground. Gyrotheodolites are not usually used within 15 degrees of the north or south poles. At these latitudes, the east-west component of the Earth’s rotation is not sufficient for reliably reproducible results. The accuracy of a gyrotheodolite is 100 times less than that of a surface theodolite even under the best circumstances.